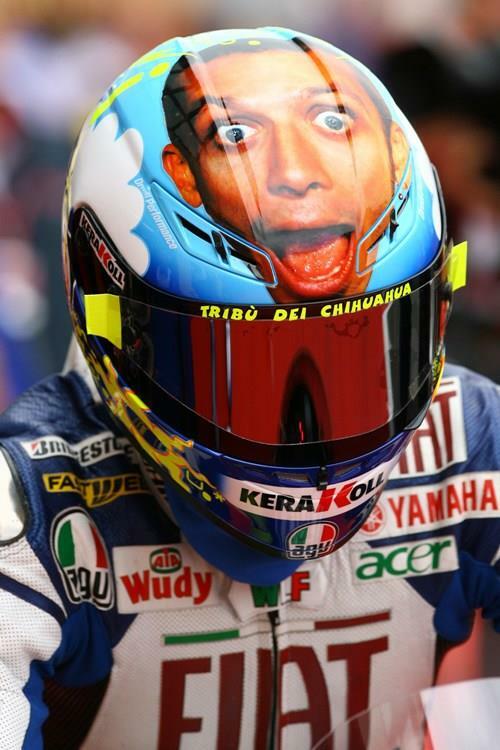 AGV is set to unveil one of the greatest personalised products to ever become available to the paying public when they announce the unveiling of a website where you can put your face on the Rossi Mugello helmet, and then buy it! The eight-time World Champion donned one of the most iconic helmets of recent times for last year’s Italian Grand Prix with his own face on the top of the lid. According to Rossi the design depicted “my expression when I bend into the San Donato curve after the straightaway in Mugello at over 300 km/h!" And now you can have your very own expression on the top of the same design, AGV has exclusively revealed to MCN. A limited run of AGV GP Tech Rossi Face helmets sold out worldwide within days when it became available last November, but as of March 3 you’ll be able to design your own version with your face or anything you want on the top. It’s really simple. Just go to www.italianlegendaryprotection.com or follow the direction from the Dainese and AGV websites as of March 3 and you’ll be taken to a specially created mini-site. From there you’ll be taken through a step-by-step guide to create your helmet, and when you’re happy with the final design you can hit a buy button. Helmets will be made in Italy at the AGV productive unit in Padova, the same place where Rossi’s GP Tech helmets are hand made, and will arrive with the customer within eight weeks of the order being placed. This unique concept was inspired by the MotoDirect team (AGV and Dainese UK distributor) who, after seeing Vale’s helmet in the AGV service truck at the Donnington Moto GP, cut and pasted Jonny Towers (MotoDirect sales director) face onto a photo of Vale’s helmet. AGV was so impressed they made a one-off GP Tech with Jonny’s face on and presented it to him at the 2009 AGV range launch in Alessandria, Italy. Around the same time of the mini-site launch, an arcade videogame will allow anyone who participates in the design of their own ‘Face’ helmet to challenge Valentino Rossi using Facebook. Wearing virtual versions of their own personalized helmets, Valentino Rossi’s fans can try to beat the Doctor’s time on the Mugello track and win one of the fantastic prizes offered by AGV. Last but not least, Dainese and AGV will auction off Valentino’s original helmet for charity in March on eBay. The price for this unique opportunity will be €1250 +20% local taxes worldwide.